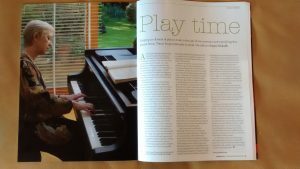 Finally I have managed to track down a copy of this month’s ‘Classical Music’ magazine, which for some reason has become harder and harder to find in the shops. Knowing there was to be an article about me in the February issue, I tried to find the magazine in a number of relevant shops, and even in several different cities, but drew a blank. (In case you’re wondering: no, the publisher didn’t send me a copy of the magazine.) Even in Blackwell’s Music Shop in Oxford they didn’t have ‘Classical Music’ and said they hadn’t been able to get it for 18 months. In most other shops – including larger branches of WHSmith where I’ve bought it in the past – they just shook their heads when I asked about it. Eventually I tracked down a copy in the library of the Royal Conservatoire of Scotland, but it was not for borrowing, so I read it and took a photo on my phone. This entry was posted on Saturday 18th February 2017 at 5:32pm	and is filed under Concerts, Daily Life. You can leave a response, or trackback from your own site. Thanks! Have you got any way of uploading a higher-definition picture? This one (about 11 KB) just blurs when it’s enlarged but it would be good to read it.